Paths To Wealth Through Common Stocks. New York: Harper & Row, 1960. First edition of Fisher’s second book. Octavo, original half cloth. 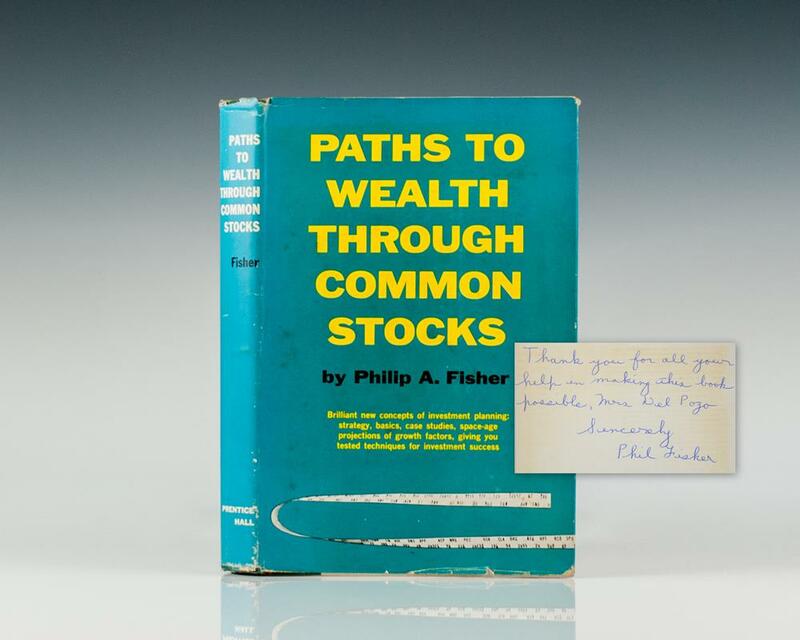 Presentation copy, inscribed by the author on the front free end paper, “Thank you for all your help in making this book possible, Mrs. Nel Pozo Sincerely Phil Fisher.” The recipient was an assistant to the author who helped Fisher with this book. Near fine in a very good dust jacket. Housed in a custom half morocco clamshell box. Most desirable inscribed example of this investment classic. Paths to Wealth through Common Stocks expands upon the innovative ideas found in Fisher's highly regarded Common Stocks and Uncommon Profitssummarizing how worthwhile profits have been and will continue to be made through common stock ownership, and revealing why his method can increase profits while reducing risk. 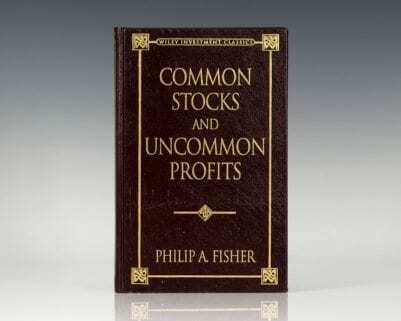 Many of the ideas found here may depart from conventional investment wisdom, but the impressive results produced by these conceptswhich are still relevant in today's market environmentwill quickly remind you why Philip Fisher is considered one of the greatest investment minds of our time. Common Stocks and Uncommon Profits. New York : John Wiley & Sons, Inc, 1997. First edition of the re-issue of this classic investment work. Octavo, original leather, gilt titles and tooling to the spine and front panel, all edges gilt. One of 1,500 numbered copies, this is number 390. In near fine condition. First edition of Fisher’s second book. Octavo, original half cloth. Presentation copy, signed by the author on the front free end paper, “I hope you like this book Frances Sincerely Phil Fisher.” Near fine in a very good dust jacket. New York: Harper & Row, 1958. First edition with C-H on the copyright page of Fisher’s classic work. Octavo, original half cloth. Inscribed by the author on the front free endpaper, “To Sol best wishes Phil Fisher.” Some light rubbing to the bottom of the cloth, near fine in a fine dust jacket. Housed in a custom half morocco clamshell box. Easily the nicest example of this title we have seen or handled, and rare signed.